Christmas and winter provide the perfect opportunity to easily theme the décor of your wedding. You can create a unique look, slightly different from the usual summer wedding ideas. Incorporating natural elements is easy and fun, with features like frosted pinecones, snowflakes, fairy lights etc. 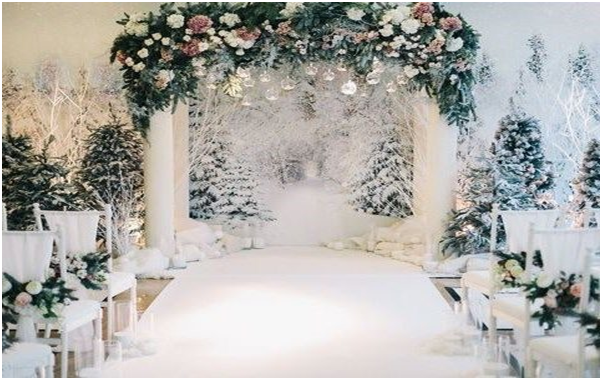 A white wedding is the perfect setting for creating a winter wonderland. The spring and summer months are the busiest time for wedding suppliers and venues. By booking your nuptials in the heart of winter, chances are you’ll get your pick of all the top vendors who might otherwise be unavailable. You’ll also find some great deals available during the winter months, with wedding businesses quiet, they’ll want to lure you in with attractive discounts. As you’ll be saving a pretty penny by staging an off-season wedding, you can spend more on the intricate details that make the day extra special. Whether you splurge on stunning wintry decorations or decide to highly personalize your wedding favours, the extra attention to detail will make your celebration much more memorable for all your guests. The great thing about a wintry backdrop is that any other colour will work with it. Whether you opt for bright glam or gentle rustic, any palette complements the neutral colours of the winter months. Combining your choice of colour with seasonal foliage is a beautiful idea to decorate your tables on the big day. Whilst the seasons of spring and summer tend to dictate wedding dress fashion, winter frees up a whole variety of dress options. 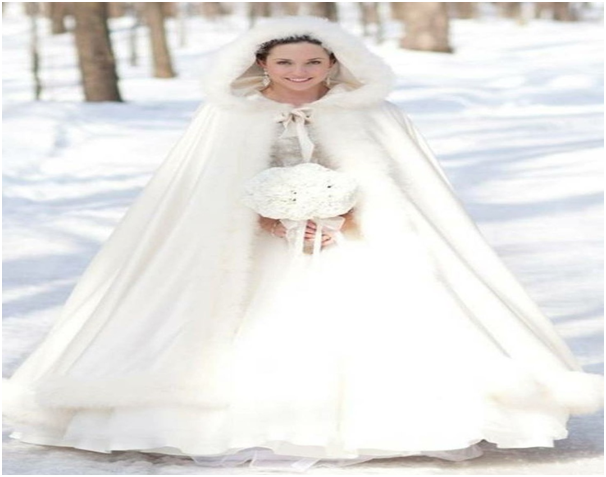 Many brides choose sleeveless in spring and strapless in summer but there are no set rules for winter. Stick with the sleeveless or strapless and combine with a stunning faux-fur shrug or classic elbow length gloves. An embroidered coat or stunning draped long sleeves, there are loads of exciting ideas for the winter bride to try something a little different. A winter wedding provides the ideal time to jet off to a tropical island for your romantic honeymoon. The contrast of weather is exciting and after a magical but cold winter wonderland, you can look forward to kicking back under a palm tree, listening to the waves and sipping on a cocktail.